The NZ Enduro is in its third year now, running this year under the watchful eyes of Sven and Anka Martin. Billed as "New Zealand's wildest multi day enduro stage race", it was something that here at Spoke we weren't going to miss an opportunity to ride! With three gorgeous locations for the three days of racing within the Marlborough region of the South Island, on a weekend just prior to Crankworx Rotorua and with the media and race guru's Anka and Sven running the show, the NZ Enduro pulled in quite a crowd this year. The start list looks like the who's who of enduro racing, plus a few DH stars, ready to give their all on the pedals. The media crew also contains, as you would expect, some of the best in the business. We sent our web editor, Rachael along to see how she faired on the trails and to let us all know what it's like to race the NZ Enduro. Jamie Nicoll has the coolest van! He won here last year, what will he do this weekend? Day one took place at Whites Bay, just 8km north of Blenheim, the bay is a rugged and exposed section of coastline on the very eastern edge of the Marlborough Sounds. Whites Bay is famous for its fragile, undersea, copper telegraph line laid in 1866 between here and Lyall Bay Welington, its a privilege that we can ride and acknowledge a site where pioneers connected the islands across the Cook Straight. They may or may not have been aware of their role in the beginnings of the instant communication we now take for granted and now rely on so heavily. This communications cable has since been usurped by one connecting Wellington and Christchurch but a building from the cable station still stands within the campground. The camp ground at White's bay is quite possibly the perfect place for a race registration and with the weather playing ball with bluebird skies and a light sea breeze, it was a chilled out and gorgeous setting to begin a race weekend. Plenty of space meant a big set up, we're talking coffee machines, registration tables full of goodies, B-Rad the bike mechanic already hard at work and a long queue of pro, semi-pro and amateur riders ready to collect their timing chips and head out for the day's racing. Such a mixed field will, no doubt, make for interesting racing and probably even more interesting conversation on the climbs. I'm based in Nelson and have been there just about 8 months now so have ridden in the Whites Bay area a couple of times. I knew that when looking at the weekend of trails, today was going to be fairly easy going, relatively speaking! With bold statements like that I must be getting used to the riding in NZ, I'm a newbie to the country and it seems that I'm no longer fazed by day one of three containing 1100m of climbing in 25 degrees heat coupled with 12 minute race stages. Stage one began 400m above sea level, which as the weather had against all odds turned it on for us, was a sweaty affair. Those having just flown in from various northern hemisphere winters would have found this to be a tad on the warm side! Stage one is a DH track named Double Eagle, a man made track which is pretty wide, traversing across the hill before descending in a series of both technical and not so technical corners. Riding blind and most of the time well and truly in the rut it was a bumpy ride from start to finish. I finished knowing that a second time round the trail would be twice as much fun and would have certainly be quicker but, hey, that's blind racing right? The trails today were massively at odds with one another, from the man made to the much more natural. Stage two saw us climb up again past the entrance to Double Eagle and on up a further 300m to just over 700m and to the Whites Bay Loop track descent. My knowledge of this track extends to the fact that its awesome! It has everything you want in a trail and is a real test of the all round rider, in fact I'd go as far as saying that this is the ultimate enduro stage. The top is a straight rooty tunnel, full of tight trees and uneven ground, the trail quickly switched to the upward direction with technical climbs where full power and well timed pedal kicks were needed. Passing through more rocky terrain, there is plenty of off camber action where precision is key and mech hangers could easily bite the dust. By now I was getting into the swing of things and had the confidence and momentum to hold the high lines that I read from the tell tale signs left by other riders passing before me. Just after the halfway point, what appeared to be a sheer wall rose up of the ground and marked the first of two testing climbs. I had to run and push the first but on the second I was given the added incentive of sighting the rider in front of me at the top and now with someone to chase, the climb didn't seem so bad. The trail finished with a series of wider turns with a feeling akin to Double Eagle, down onto a fire road with a dirty g-out and I was done. The trail finished earlier than I thought it would and given the fun I was having, despite breathing like a steam train, I was disappointed to stop riding. If there had been a shuttle on hand to take me back up for run number two I'd have been in the front seat as fast as you can say Sram! Coasting our way back down the road and back to the registration area was an easy affair, I handed in my timing chip where Karl from the Nelson MTB Club was working his magic with their new timing system. With a great atmosphere we chilled out in the sun, swam in the sean and ate food provided by Marlborough MTB Club. As I said previously, race HQ perfection! I'm all prepped for a turn of the weather tomorrow, the rain looks like it can't possibly not hit us. I'm doing my bit and going out in waterproof socks in order to bring in the sun! Tomorrow we ride the Nydia Track linking bays along the Pelorus Sounds’ coastline, I'm expecting rainfall into the double figures, it will be as the race is meant to be - wild. Check out the full gallery of images from Neil Kerr below. 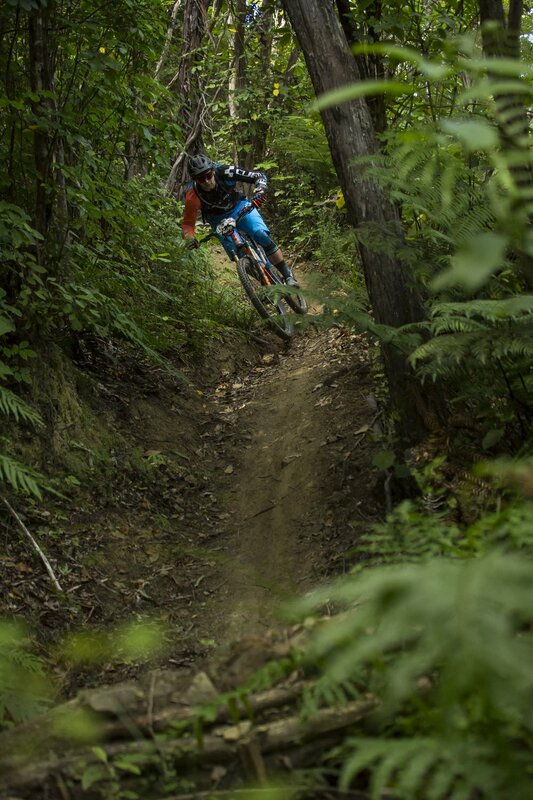 Want to know what the NZ Enduro was all about in three words from the Pro's? The final day of the NZ Enduro 2017 didn't quite go to plan, check out the details here and then get involved with the weekend's edits! The NZ Enduro kicked off today over at Whites Bay with the sun high in the sky and a start list to turn heads!